CAFs are primarily composed of fibroblasts and myofibroblasts, of which the latter displays a mixed phenotype of fibroblast and smooth muscle cells by having a prominent rough endoplasmic reticulum of fibroblasts and contractile filaments (e.g., smooth-muscle actin) of smooth muscle cells . The crosstalk between the tumor and CAFs assists tumor cells in acquiring unique characteristics such as enhanced proliferation, metastatic and angiogenic properties, immune evasion and chemoresistance [11, 12]. It has been postulated that dysregulated activities of certain nuclear factors in CAFs could contribute to their tumor-supportive roles. CAFs have markedly distinct gene expression profiles of NRs compared with their normal cognate fibroblasts. Indeed, CAFs isolated from human breast tumors exhibit vastly different NR fingerprints compared with normal breast fibroblasts, as exemplified by the downregulation of THR-β, VDR, ROR-α, and PPAR-γ in CAFs . Furthermore, NR signatures also differ among CAFs isolated from different types of tumors [13–15]. Such disparities in NR profiles could be an intrinsic characteristic of fibroblasts at different anatomical positions, or due to cellular signals released by different host cancer cells and other surrounding stromal cells. In this context, our recent study using clinical cutaneous squamous cell carcinoma has confirmed the differential gene expression of NRs in CAFs compared with normal fibroblasts . We have also shown that the transcriptomes of tumor cells cocultured with CAFs can be altered by reversing the expression pattern of selected NRs, namely, PPARβ/δ, VDR, AR and retinoic acid receptor (RAR)-β receptor, to result in functional changes such as impaired invasiveness, reduced proliferation, and altered energy metabolism and redox response . More importantly, when the squamous cell carcinoma cultures are exposed to conditioned medium from CAFs pretreated with either RARβ or AR antagonists, the CAF-induced cisplatin resistance is completely abolished . Our study strongly supports the druggability of NRs in TME, notably AR and RARβ, which can mediate a CAF-directed cancer therapy. In line with our findings, AR in the tumor stroma has been consistently found to be a predominant factor in the prognosis of prostate cancer . Nevertheless, unlike squamous cell carcinoma, in which the inhibition of AR of CAFs could be beneficial, low levels or loss of AR in the stromal cells of prostate cancer are associated with poorer clinical outcomes [17–22]. Such an association is mind-boggling given that androgen deprivation therapy, which aims to suppress AR signaling in tumor cells, often serves as the frontline treatment of prostate cancer . Genome-wide CHIPseq has revealed that AR in prostate CAFs has distinct binding sites and binding sequence motifs compared with tumor cells, suggesting differences in AR-regulated genes between the two cell populations . This finding could explain the discrepancy in AR function between prostate CAFs and cancer cells. The tumor stroma liberates various androgen-responsive growth factors and cytokines that modulate the cell fate, proliferation and drug sensitivity of prostate cancer cells [25–27]. These paracrine factors are favorable for the growth of tumor cells present in this environment. Although ablation of ARs in CAFs could attenuate cancer proliferation , the loss of AR signaling activity is also linked to the onset of metastatic phenotypes such as increased stemness, enhanced cell migration and weakening of the extracellular matrix (ECM) structure and integrity [22, 29, 30]. As a result, the suppression of AR in CAFs may potentially exacerbate the epithelial-mesenchymal transition and metastasis of prostate cancer, underpinning the association of AR loss in CAFs with adverse clinical outcomes in prostate cancer progression. In short, the pathological roles of AR in CAFs are well-implicated in the development of prostate cancer, making it an attractive therapeutic target. However, considering the opposite effects of AR blockade in tumor and stromal cells, an ideal anti-androgenic agent should decrease tumor AR but enhance stromal AR activity . 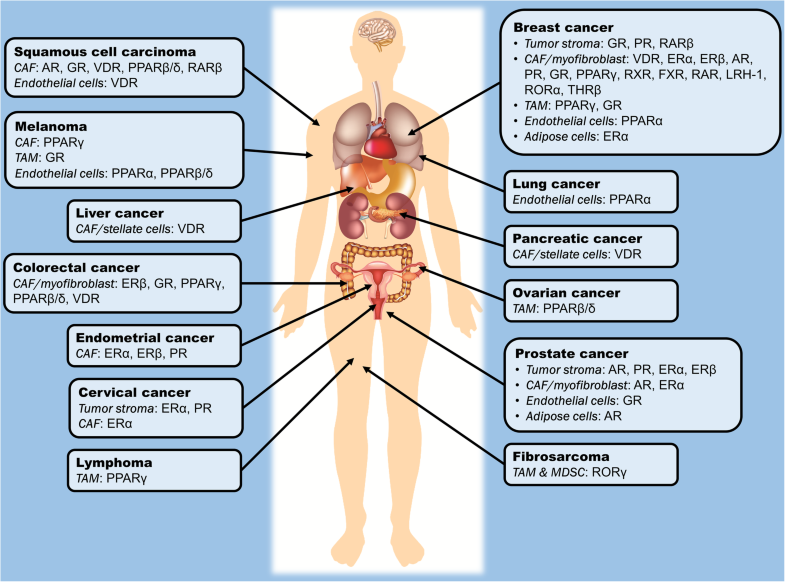 It is also worth mentioning that the current understanding of AR in CAFs is mostly derived from hormone-dependent tumors, especially prostate and breast cancers [16, 31]. Thus, in light of the evidence mentioned above, it is worthwhile to extend research on AR to other types of tumors to better characterize its roles in cancer biology. In addition to AR, steroid hormone NRs in CAFs, including ERα and β, PR and GR, are also relatively well-studied. The expression of ERα has been detected in the CAFs of breast , endometrial , cervical  and prostate cancers , but not in colorectal carcinoma . However, the clinical implications of ERα are diverse. In some studies, ERα-expressing CAFs have been reported to promote prostate and endometrial cancer cell proliferation [32, 36]; in other studies, CAFs attenuated prostate tumor cell invasiveness and immune cell infiltration by altering the levels of anti-angiogenic factors, ECM remodeling factors as well as chemokines, in addition to conserving chemosensitivity in certain breast cancer cell lines [37–39]. Similarly, divergent results have also been obtained in clinical biopsies, in which one association study found a positive correlation between ERα expression in CAFs with advanced prostate cancer stage , while the reverse trend was found in cervical cancer . Despite these perplexing findings, a recent comparative transcriptomic study demonstrated differential expression patterns between CAFs isolated from early- and late-stage cervical cancer, with the latter being more metabolically and proliferatively active upon estradiol exposure . Treatment with ER antagonists, namely, ICI182780 and methylpiperidino pyrazole, not only reverses the aforementioned changes but also suppresses the expression of genes linked to angiogenesis and cell adhesion . Additionally, liver receptor homolog-1 (LRH-1), which is an orphan NR, is transcriptionally responsive to estrogen treatment and ERα activation . In breast cancer-derived CAFs, LRH-1, which is highly expressed in these cells, can upregulate aromatase (CYP19) gene expression [13, 42]. This observation is indicative of an ERα-mediated loop of estrogen biosynthesis via LRH-1 in CAFs, which may contribute to the increased tumor cell proliferation. Hence, disrupting the paracrine signaling directed by ERα in CAFs may be beneficial, making NR an exploitable target for cancer therapy. However, further investigation is warranted to clarify the conflicting results about the tumorigenic properties of ERα. 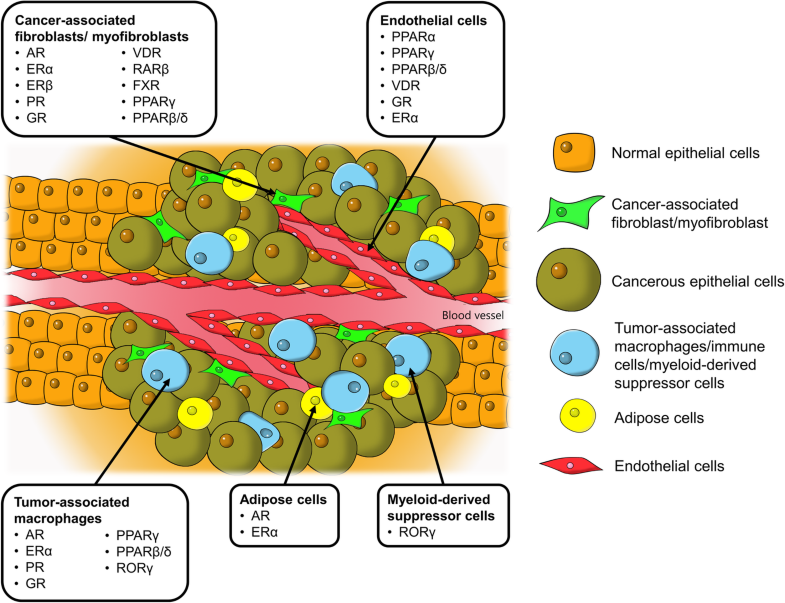 While ERα is well-implicated in TME of many hormone-dependent cancers, its role is less pronounced in the CAFs of breast cancer, likely because its expression is predominantly localized in the tumor epithelium instead of the surrounding fibroblasts [43–45]. In contrast, ERβ, which is the other ER isotype, is widely found in the breast cancer stroma [35, 46]. Despite their structural similarities, the bioactivities of ERα and β in tumor epithelium are largely counteractive, whereby ERβ is anti-proliferative and ERα-antagonizing [47, 48]. Whether ERβ in CAFs also confers an anti-tumor effect is uncertain. One study revealed that progesterone and epidermal growth factor receptors are highly expressed in the uterine stroma of ERβ-knockout mice, especially when 17β-estradiol and progesterone are coadministered . This phenomenon contributed to the hyperproliferation and impaired cellular differentiation observed in the uterine epithelium of ERβ-knockout mice . Conversely, PR also exhibits ERα-antagonizing properties in tumor cells . Its expression in cancer-associated stroma is repressed in comparison to benign stroma in prostate glands [51, 52]. Stromal PR actively takes part in stromal cell differentiation . Although conditioned medium from PR-positive CAFs has a negligible effect on prostate cancer cell proliferation, cell motility and migration are vastly inhibited via the suppression of stromal-derived factor-1 and interleukin (IL)-6 . These findings highlight the importance of stromal ERβ and PR in stroma-tumor epithelium crosstalk in modulating cancer progression, but tissue-specific inhibition or activation of these NRs in CAFs is imperative to outline the feasibility of exploiting them as therapeutic cancer targets. In addition to steroid hormone NRs, VDR in CAFs is also increasingly appreciated as a key anti-carcinogenic target. Ferrer-Mayorga et al. (2017) reported a positive correlation between the gene expression of stromal VDR with overall survival and progression-free survival in colorectal cancer . Genes such as CD82 and S100A4, which are responsive to calcitriol in CAFs, are also associated with clinical outcomes and stromal VDR expression in patients with colorectal cancer, supporting a clinical value of VDR agonists in cancer treatment . Conversely, pancreatic and hepatic TME is enriched by myofibroblast-like stellate cells, which upon activation, become proinflammatory, fibrogenic and tumor supportive [60, 61]. Based on a transcriptomic analysis, calcipotriol, which is a nonhypercalcemic vitamin D analog, maintains the quiescent state and modifies the secretomes of pancreatic stellate cells by reducing the expression of inflammatory cytokines, ECM components, and growth factors . Similar trends have also been observed in hepatic stellate cells [63, 64]. Combined therapy with gemcitabine plus calcipotriol tremendously improves the treatment outcomes of mice with orthotopic pancreatic ductal adenocarcinoma transplant, as evidenced by intratumoral aggregation of chemotherapy agents, a diminished tumor size and a higher survival rate . A very recent report also suggests a regulatory role of VDR on CAF-liberated exosomal miRNA (e.g., miR-10a-5p and miR-181a-5p) . Hence, exposure of CAFs to VDR ligands may modulate the stroma-tumor crosstalk not only via paracrine signaling but also by manipulation of the exosomal content. Despite promising results from preclinical studies, most clinical trials that employed vitamin D for cancer therapy and prevention have yielded underwhelming results, which reflects an inadequate understanding of VDR actions in both tumor and stromal cells [66–68]. Thus, an in-depth dissection of the biological roles of VDR in TME is critical to enable effective VDR-centric cancer treatment. In contrast to GR, the role of AR, ER, and PR-dependent tumorigenesis is poorly defined. The presence of TAMs influences the expression of ERα, ERβ and PR in tumor cells [85–87]. Reciprocally, the number of TAMs also appears to be modulated by steroid hormone NRs of tumor cells, particularly ER . Moreover, in wound healing and lung inflammatory studies, activation of AR, ERα and PR by their cognate steroid hormones would favor macrophage activation in an alternative manner, producing M2 macrophages that compel cellular repair and angiogenic processes [89–91]. The studies suggest that steroid hormones are vital determinants in the alternative differentiation of macrophages to modulate pulmonary inflammation and wound recovery. However, there is no direct evidence supporting the contribution of AR, ER, and PR to the formation of M2 macrophages in TME. Thus, future research should focus on explicating the roles of these NRs in TAM formation and tumor-supporting events. The three isotypes of PPARs, PPARα, PPARβ/δ, and PPARγ, are widely known to influence carcinogenic activities. However, current evidence is somewhat paradoxical concerning their roles in tumor cells, leading to the speculation that their actual functions could be dependent on the ligands, cancer types or even cancer stages . In immune cells, PPARs also govern the fate of macrophage activation, likely because the maturation of macrophages is tightly linked to their metabolic state. To enable alternative activation of macrophages, immune cells must undergo oxidative metabolism, which is modulated by PPARs . Macrophages that are unable to clear the metabolic checkpoint due to deletion of PPARγ, PPARβ/δ and PPARγ coactivator 1β (PGC-1β), are incapable of expressing the alternative phenotype [94–96]. In contrast, treatment with PPARα or -γ agonists fosters the enrichment of M2-related biomarkers in macrophages . Recently, a ligand-independent mechanism that involves PPARγ in TAM differentiation has also been described, which involves the cleavage of PPARγ by caspase-1 and thereby produces a 41-kDa receptor fragment that translocates into mitochondria and interacts with medium-chain acyl-CoA dehydrogenase . This interaction shuts down the enzyme and attenuates fatty acid oxidation, leading to intracellular aggregation of lipid droplets that drive TAM differentiation . These results support the pro-tumor activities of PPARγ via promoting TAM formation. Likewise, PPARβ/δ also seems to follow a similar trajectory . Notwithstanding, other empirical findings support a counterargument [100, 101]. The clinical use of thiazolidinedione is also not associated with an increased risk of many malignancies . Collectively, the roles of PPARs in TAM differentiation and tumor progression undoubtedly remain an open topic necessitating further investigation.